An aerial view of Perth Airport. All of Australia’s biggest four airports have been rated as “good” by the airlines and passengers that use them for the first time in more than a decade, a report says. 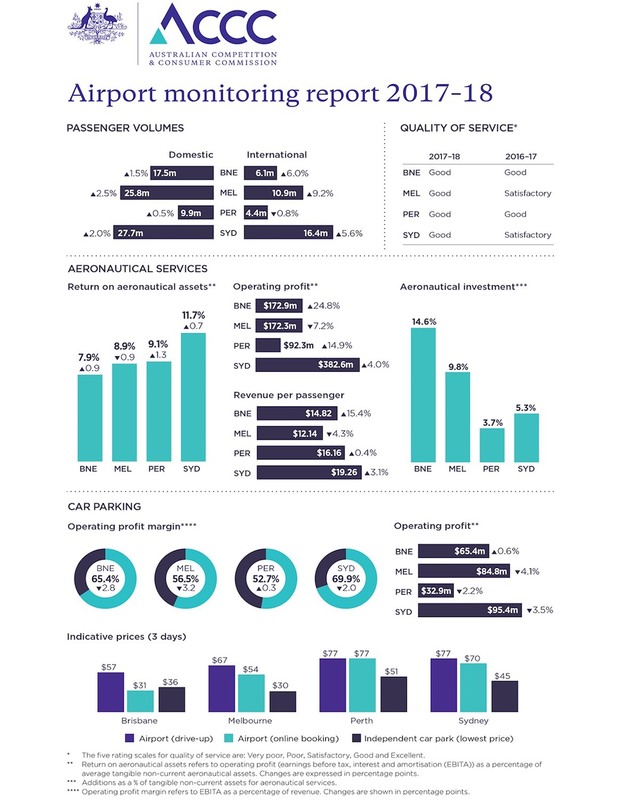 The Australian Competition and Consumer Commission’s (ACCC) annual Airport Monitoring Report for 2017/18 has found Brisbane, Melbourne, Perth and Sydney airports achieved an overall quality of service rating of good. Brisbane and Perth retained their good rating, Melbourne and Sydney lifted their from satisfactory the previous year. “For the first time over the last decade, all four monitored airports were rated as ‘good’ for their overall quality of service,” the ACCC report said. The airports’ overall quality of service ratings comprised responses of both airlines and passengers, as well as objective measures. The report said passengers rated all four airports as good. Meanwhile, only Perth Airport achieved a good rating from the airlines for a third straight year, with Melbourne, Perth and Sydney airports retaining their satisfactory rating. “It is pleasing to see that all four airports have been rated as ‘good’ in terms of overall quality of service, but there is considerable scope for further improvement, in the service provided to airlines in particular,” Australian Competition and Consumer Commission (ACCC) chairman Rod Sims said in a statement. Perth Airport chief executive Kevin Brown noted the company had secured new agreements with 23 out of the 24 airlines that use the airport. “We see that as clear evidence that our airline partners see our pricing as fair and reasonable,” Brown said in a statement. “Their responses to the ACCC also confirm that they believe our service levels continue to improve as we work with them for a better airport. 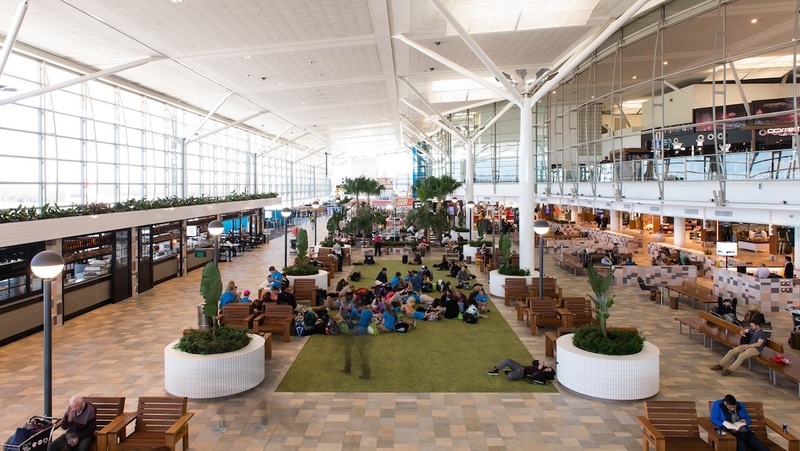 Brisbane Airport chief executive Gert-Jan de Graaff said the airport’s capital investment – which included $341.2 million in aeronautical facilities during 2017/18 – had supported the arrival of seven new airlines over the past two years and better facilities for travellers. “This could not have been achieved without the significant expansion of the international terminal and investment in systems, facilities and technology that help to manage increased demand and improve airline efficiency and the passenger experience overall,” de Graaff said in a statement. The Airport Monitoring Report said aeronautical profits at Brisbane, Melbourne, Perth and Sydney airports grew 6.2 per cent to $820.1 million in 2017/18. Further, margins on aeronautical profits were between 38.6 per cent and 49.3 per cent. “Overall the growth in aeronautical profits at Australia’s four biggest airports continues apace,” Sims said. Currently, the Australian Government’s Productivity Commission is conducting an inquiry into the economic regulation of airports. 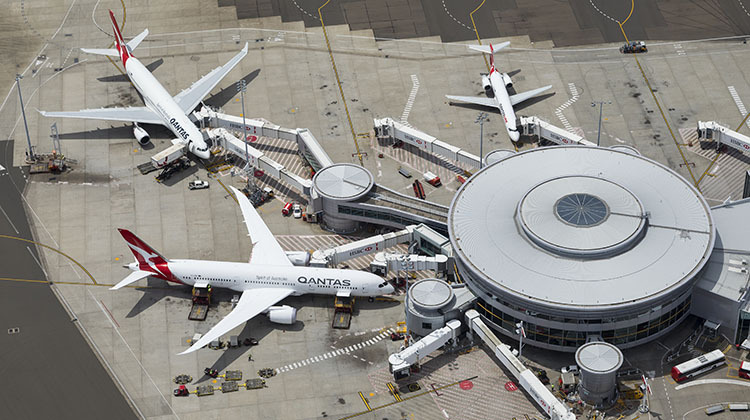 The draft report, published in early February, concluded Australia’s existing regulations of the nation’s airports benefitted the community and remained fit for purpose. Further, it said Australia’s largest airports Brisbane, Melbourne, Perth and Sydney had not systematically exercised their market power to the detriment of the community. And while the draft report found there was no need to change to the so-called light-handed regulation Australia’s airports, it one of the recommendations was for the ACCC to boost monitoring of the country’s biggest airports. The Productivity Commission was due to hold public hearings in Canberra, Melbourne, Mildura and Sydney as part of its inquiry in March. The ACCC, along with lobby group Airlines for Australia and New Zealand, had argued for a change to the regulations to allow for independent arbitration in cases where airports and airlines were unable to reach an agreement on aeronautical charges. Sims said it was a independent arbitration was a “pragmatic solution for resolving disputes between airports and airlines”. “Any party frustrating commercial negotiations would face the threat of an independent arbitrator determining prices and terms of access,” Sims said. Australian Airports Association chief executive Caroline Wilkie said the Airport Monitoring Report reinforced the conclusions of the Productivity Commission’s draft report. 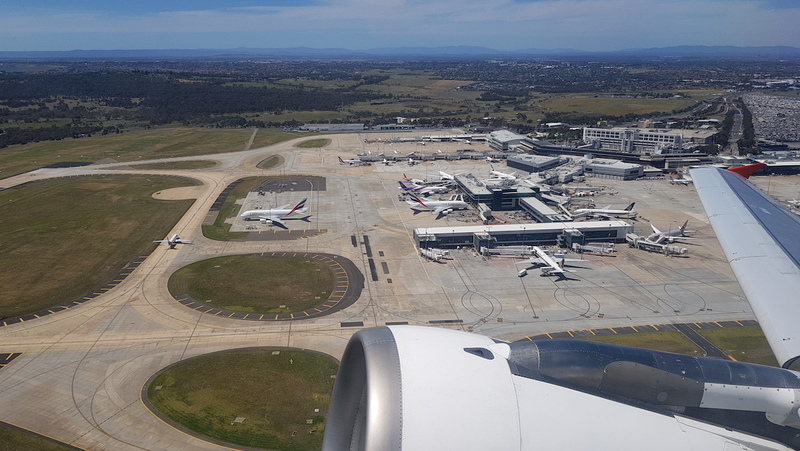 “It is particularly pleasing that the report indicates all four airports have achieved an overall quality of service rating of good,” Wilkie said in a statement. Airline for Australia and New Zealand (A4ANZ) chief executive Alison Roberts noted the ACCC had reiterated that price monitoring was not sufficient to constrain the behaviour of companies with significant market power such as airports. 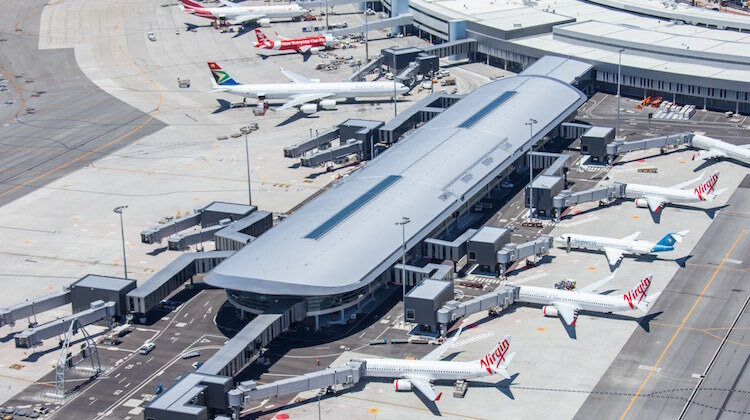 “Along with A4ANZ and regulatory experts, the ACCC has strongly advocated for independent arbitration in cases where airports and airlines cannot agree on the pricing of aeronautical services,” Dr Roberts said in a statement. The full report can be read on the ACCC website. This is surprising as far as Melbourne Tullamarine goes. It is poorly designed and the facilities for meals are limited and very very expensive. What aspect is poorly designed? “Perth Airport chief executive Kevin Brown noted the company had secured new agreements with 23 out of the 24 airlines that use the airport.” And guess which airline is most likely the 24TH!!! LOL.